Apple has unveiled its gaming subscription service, Apple Arcade, and it looks promising: for a recurring fee, customers can play any number of games in the service’s catalogue on their iPhone, iPad, Mac, and Apple TV at no additional cost...and since they’re all exclusives, you won’t be able to play them anywhere else. These aren’t just random developers, either: Apple has secured titles from big-time names in gaming, like Hironobu Sakaguchi (creator of Final Fantasy), Ken Wong (designer and artist on Monument Valley) and Will Wright (creator of Sim City). Games will come from studios large and small, including: Konami, Klei, Annapurna Interactive, LEGO, Klei Entertainment, Mistwalker Corporation, SEGA, Giant Squid, Finji and more. The service will feature over 100 of these "new and exclusive" titles, according to a press release, with some or all available when it launches in fall 2019 in over 150 countries. You’ll be able to find it in the App Store (it has a dedicated tab on the bottom row), and new games will be added “on a regular basis." You aren't streaming these games; instead, you'll be able to download them to your device and play from there. This is just one of many differences between Apple Arcade and Google Stadia, the search giant's upcoming streaming-only gaming service. But we still don’t know a lot about Apple Arcade. Here are our biggest questions. Will the multiplatform accessibility limit the games? This is a big one. Apple is betting on convenience and accessibility here: supposedly, progress carries over from device to device, meaning you can start playing on your iPhone and casually switch over to playing on your Apple TV. How that transition will end up working is a whole other question, but even requiring titles to play across nearly all of Apple’s devices suggests a lot about what these games will – and won’t – look like. For one, they probably won’t be graphical powerhouses. The iPhone XS Max and iPad Pro 2018 are beasts in their own right, but their specs don’t hold a candle to desktop processing, let alone the leading game-specific consoles, the Xbox One X and PS4 Pro. This has a lot of ramifications for the games catalogue, as well as design: by limiting the service to older and mostly (but not all) touch-interface devices, Arcade titles may have to restrict their complexity. What will the game catalogue look like over time? This is probably the biggest make-or-break condition. 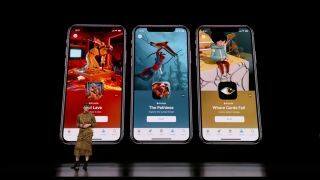 Apple is promising 100 "new and exclusive" titles, though it’s unclear if they’ll all be available when the service goes live in "fall 2019," as Apple forecasts. But will all games be new and exclusive? That’s a tall order for developers, especially those who want to achieve the kind of notoriety and success of phenomenons like Fortnite or Apex Legends, which all thrive off multi-platform availability. There’s the reverse situation, too: will older games be added to Arcade, or must they be new and exclusive? Put another way: will paying subscribers get to harness ‘unlimited play’ for other titles that debuted elsewhere first? Given how enthusiastic folks have been to see old favorites added to Xbox Game Pass and other services, Arcade’s catalogue composition is a huge question mark. Likewise, will Arcade’s catalogue of games be exclusives forever? Of the handful of titles Apple showed off in the streaming event, one seemed most likely to make the jump to other platforms: Sonic Racing, a Sega game in a series that has almost always been multiplatform. If it’s a timed exclusive, players might just wait it out until high-profile titles drift elsewhere. Apple didn’t mention anything about multiplayer in its Apple Arcade press release, and that could be telling. Will its games be single-player only? Or perhaps, like the Annapurna Interactive-published classic game Journey, will multiplayer be limited to asymmetric or non-interactive sharing of space? It’s a huge question given how popular multiplayer-only titles like Fortnite and Clash Royale have been. Of course, it seems like Apple is happy to keep those games in the free-to-play corner of the App Store while the few games it’s boasted for Arcade seem story-driven...except one: LEGO Brawls. Aside from being right there in the title, the only image accompanying Brawls has a bunch of LEGO minifigures from mismatched settings, all wielding a hodgepodge of weaponry and flying in wild vehicles. In the background, something is exploding. It looks like a LEGO-fied Fortnite, honestly – and while it’s possible this is a single-player title, the ‘wacky combat’ appeal seems tailor-made for, er, brawling with friends and strangers. Those are our biggest questions, and we’ll have to wait for more Apple Arcade announcements to get a clearer picture of what the service offers...and what kind of players the company believes will sign up.